If everything goes as expected, AMD next generation of video cards (Southern Islands aka Radeon HD 7000) will be released in the Q3 of 2011. According to current rumors, it was set for a 2011 Q3-Q4 release. However, we’ve heard that company is keen on delivering its 28nm GPU’s before nVidia does and therefore, is working with GF to make that possible. According to our sources, earlier release is likely as well and it all comes down to manufacturing process. Update: AMD has shifted their strategy and will not be using GF to produce 28nm chips. 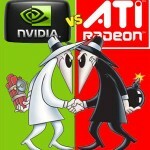 As a result, 28nm GPUs are now coming in late 2011 or early 2012. Need hits on your site do you ? Not news, just rumours and speculation .. anyone can post stuff like this up .. “It all comes down to manufacturing process” .. well no sh1t Sherlock .. !! Not so long to wait, just few more days… 9th of November. This site wasn’t created for the value of “nothing”, you know. Heh, I will even close this site, if our insiders were wrong (and they aren’t). You’re not under NDA. AMD hasn’t held any conferences or meetings that require NDA signings for the SI architecture. Nice try. As it stands though, late Q2 is very possible. Real question: if he already knew, then why was he looking here? idk if he is telling the truth or not BUT: this logic is not conclusive. if you were privy to info ahead of time and saw sites posting about something you knew, isnt it plausible that you may be curious to see if the truth is out yet or how close these rumor sites are to the truth? that you may be curious to see if the truth is out yet or how close these rumor sites are to the truth?